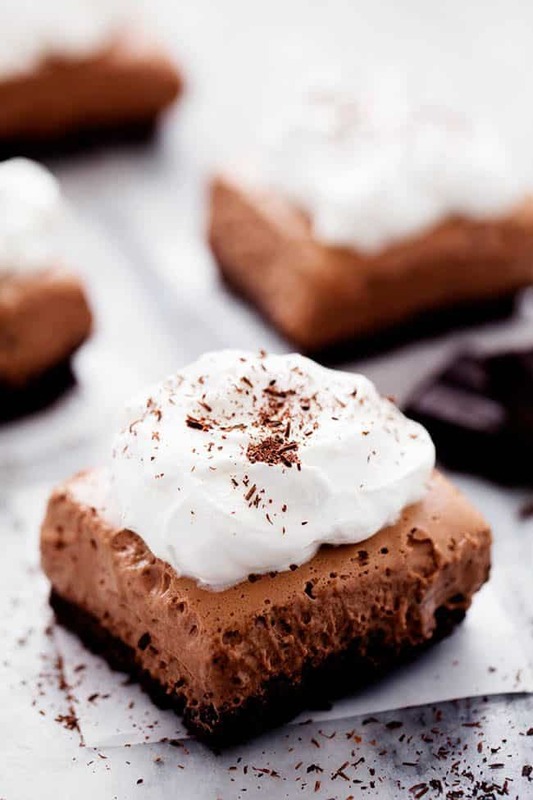 French silk pie bars are rich, creamy, and smooth and made with a chocolate graham cracker crust. This classic dessert is incredible and will turn into an instant favorite! I recently completed a nine week nutrition challenge at our local crossfit gym. It.was.hard. You basically have to eat clean with no snacks, fast food, or soda for nine weeks. We had partners and we both worked so hard and would even meal prep together each week. We took first place in the competition and we were so excited! Now I am all about living a healthy lifestyle. I eat pretty clean durning the week and portion control the meals that I make for my family. But I am ALL about adding in a delicious dessert and indulging every once in a while. 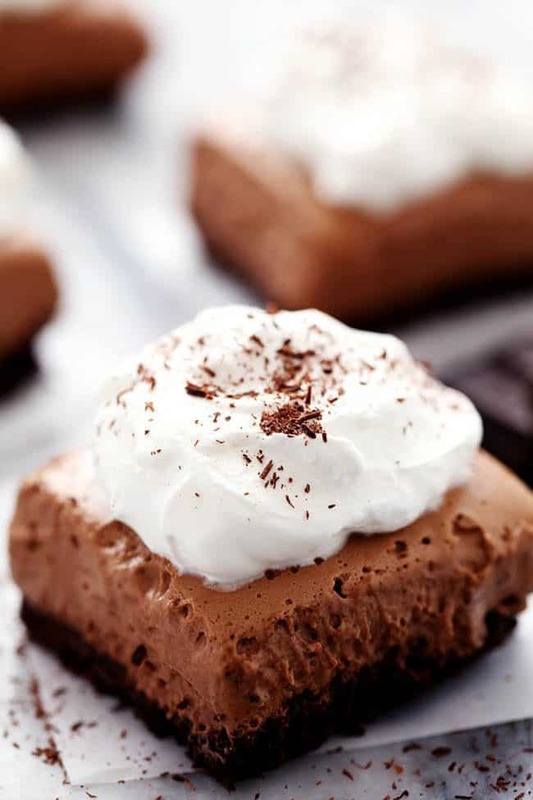 These French Silk Pie Bars were the first dessert after nine long weeks. And let me just say that they blew my mind! The classic french silk is made with raw eggs. So you do have to eat these bars at your own risk. But I survived eating them and they were worth every single bite! This was the one of the BEST desserts that I have EVER had. 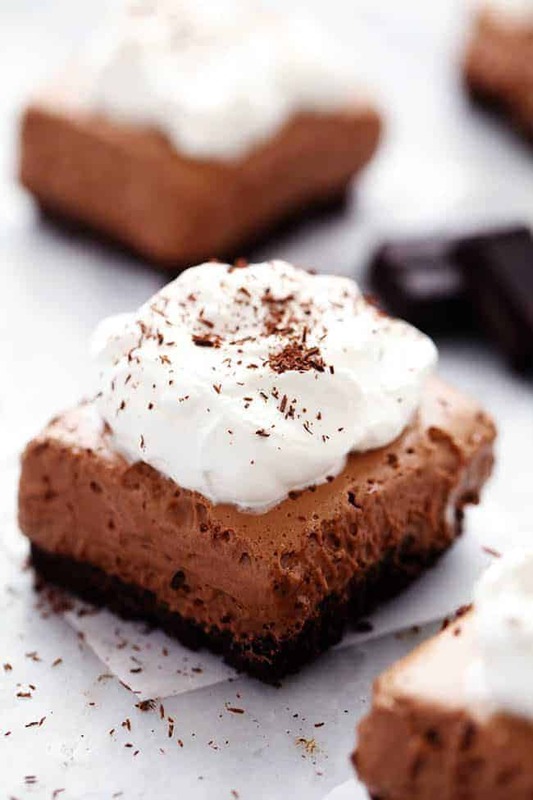 They start with a delicious chocolate graham cracker crust. These bars are almost no bake but if you bake the crust first, it helps to hold the crust together making the bars easier to cut. You could always make the crust without baking it to make these 100% no bake. You will not regret making this dessert! It is especially amazing topped with fresh whipped cream and chocolate shavings. This is a fantastic dessert that you will want to make again and again! Preheat oven to 325 degrees. Line an 8x8 inch pan with aluminum foil so that you can easily remove and cut the bars. In a medium sized bowl combine graham cracker crumbs, sugar, and melted butter. Press into the bottom of the 8x8 inch pan and bake for 10 minutes. Let the crust completely cool. To make the french silk filling: In a small microwave safe bowl melt the unsweetened baking chocolate 30 seconds at a time until smooth. Let cool to room temperature. In the bowl of a stand mixer beat the butter and powdered sugar about 2 minutes until creamy. Add the melted chocolate mixture and beat until incorporated. Add the vanilla. Using the whisk attachment add one egg at a time beating 5 minutes on medium speed between each addition. You should be beating for a total of 20 minutes. Pour over the chocolate graham cracker crust and refrigerate for 3 hours or until set. *This recipe contains raw eggs. Consume at your own risk. You can coddle the eggs. Made these today and they were amazing! Love the idea of this pie as a bar. Thanks so much!